"Forty-five human rights activists called upon fellow New Yorkers to boycott the Israel Ballet at its performance Sunday at the Brooklyn Center for the Performing Arts. Accompanied by the Rude Mechanical Orchestra, protesters performed ballet, sang, chanted, and handed out mock programs to bring attention to the Israel Ballet's role in the Israeli state's use of the arts to whitewash its crimes against the Palestinian people. The demonstration was the third to take place along the Ballet company's U.S. tour in as many days. 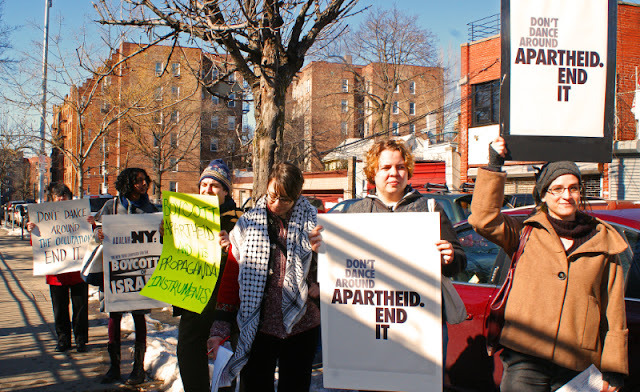 Hundreds of people entering the Brooklyn Center for the Performing Arts were handed mock programs that, when opened, described the connections between the Israel Ballet and Israeli apartheid. Outside of the venue, attendees could hear protesters chanting 'Pas de deux or arabesque / The occupation is grotesque' and 'A little tutu cannot hide / Your support for apartheid!' Dave Lippman of Adalah-NY commented, 'We are here to let the Israel Ballet know that it cannot tip-toe around apartheid.' Protesting ballerinas dressed in blue and white tutus (Israel's national colors) and wearing masks performed a waltz that transformed into a military drill march. As the orchestra switched to a two-beat march, the dancers lifted their masks to reveal camouflage on their faces. Dancer Ayesha Hoda commented, 'With this 'ResisDance,' we expose Israel's cynical use of the arts to mask facts about its occupation, racial discrimination and even war crimes against the Palestinian people, as revealed in the UN’s recently published Goldstone Report on Israel’s war of aggression on Gaza.” "
"The Israel Ballet is currently touring the U.S. as part of "Brand Israel", a campaign launched in August 2009 by Israeli Ministry of Foreign Affairs as attempt to give the controversial state a new international image, in the wake of unanimous condemnation from the major human rights organizations and, most recently, the U.N. Goldstone Report....Former Israeli soldier and human rights activist Yonatan Shapira, who took part in the action said, “The Israel Ballet comes to the U.S. during a concerted effort by the Israeli government to use arts and culture to whitewash Israeli war crimes and to conceal facts about its occupation and racial discrimination against the Palestinian people. Rather than distancing itself from the Israeli government, the ballet has proudly embraced its ties with the state.” The Israel Ballet receives around $1 million annually from the Israeli government and is being advertised as a valued cultural representative of the state by the Israeli Consulate in New York. The dance group also boasts holding “special performances” for Israeli soldiers. Shapira is an army refuser who is active with Boycott!, the Israeli group that supports the Palestinian call for Boycott, Divestment and Sanctions (BDS) against the Israel." Israel ballet interrupted in Burlington, Vt. - No tutu is big enough to cover Israel's War Crimes from samayfield on Vimeo. "Human rights activists interrupted a performance by the Israeli Ballet in Burlington, Vermont on Friday. During the performance, demonstrators held up a sign reading “No tutu is begin enough to cover up war crimes.” A coalition of pro-Palestinian groups have called for a boycott of the Israeli ballet and other Israeli cultural and academic institutions. Protesters also rallied over the weekend outside performances of the Israeli Ballet in Worcester, Massachusetts and Brooklyn, New York. A video of the Burlington protest was posted on YouTube by the filmmaker Sam Mayfield, but YouTube removed the video, claiming it was in “violation of the YouTube Community Guidelines.” "
For more information and pictures, visit the Adalah-NY website, and click here to find out more ways to get involved in BDS in your community.